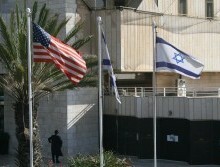 The United States and Israel conduct joint training exercises every year that involve missile defense. It’s only fitting that the day before US and Israeli troops began the latest round of exercises, the American Army announced formal plans to buy Israel’s Iron Dome missile defense system. Discussions surrounding the purchase have been going on for months, according to The Times of Israel, but were made official on Wednesday in a statement from the US Army. US Army Col. Patrick Seiber, according to a statement published by CNN, said that the Iron Dome would be “assessed” as an option to protect US armed forces, amongst other options. He said no decision had been made on a specific location for assigning the Iron Dome batteries. The Times of Israel report back in January said that the US military wanted to buy two Iron Dome batteries. On Thursday of this week, the day after the formal purchase announcement was made, US troops began arriving in Israel for the Juniper Falcon 2019 exercise. A report on the Israeli Air Force website about the training program said that it will involve hundreds of Americans and Israelis and focuses on cooperation in missile defense.